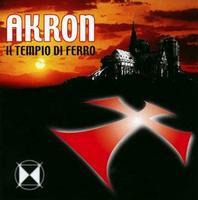 “The Iron Temple” is ominous Italian music at its most obscure. It does not belong to our time. There are no guitars. The compositions centre on slow bass lines and have been embellished with Hammond organ, keyboards and the dark operatic vocals of Eugenio Mucci and Gabriella Saia. The album explores the murky history of the Knights’ Templar. However, as all of lyrics are in the Italian tongue their slant evades any such interpretation. But if the haunting atmosphere is an indication of their flavour it is far from a holy tribute to the order. Even now, on paper, the lure of this album may seem incomprehensible yet once immersed in the eerie flow there is no coming back. It is that gripping. Every element has its place. The gently paced and beautifully crafted “Il Giuramento” and “A Gerushalemme” account for the opening third of the album. They set a classical and progressive tone yet without betraying the breadth of what will follow. As it happens, the shorter title track is on their tail. But it is harsh in its delivery and this unexpected violence is mirrored in the vocals with shocking clarity. The chasm opens as the ledge gives way. Tread carefully. The nightmare has just begun. Revel in it if you have the nerve.